First 24 hours with Windows 8.1 on W520 laptop (mostly) smooth sailing! My W520 laptop now has Windows 8.1 installed, which is running VMware Workstation 10 to run a VM of Windows 8.1 on an 8TB GPT C: drive, using just 8GB actual storage. Follow? Now that the RTM (Release To Manufacture) 8.1 code has been released to MSDN/TechNet quite by surprise yesterday, I've been able to kick the tires on the actual code that'll become GA (Generally Available) in mid October. This first 24 hours of tire kicking has already given me numerous little tips and tricks to share, hope you find it helpful! This was an upgrade install. Overall, my system has less quirks with some video memory related issues. Granted, those are self induced issues, but it's a good sign that Windows 8.1 is handling triple monitors better than 8.0 ever did. I am pushing 7.8 million pixels around 3 monitors, which is very near 4K/8.3 million. Lenovo ThinkPad W520 - Upgrade from Windows 8 Pro to Windows 8.1 Pro took about 60 minutes overall. Disclaimer: if you're thinking of upgrading, do a complete backup of your hard drive first, and test restore that backup! This particular build is my own hard drive image, with a lot of applications, and a somewhat complex triple monitor configuration that I detailed [here](How to enjoy Windows 8 on your Lenovo ThinkPad W520 laptop, with 3 external monitors, and an external keyboard and mouse Posted by Paul Braren on Sun Dec 9th, 2012). It was mostly uneventful, and remarkably without video or printer driver woes. Lenovo doesn't have any Windows 8.1 specific drivers or recommended driver updates for the W520 here. Usually I uninstall all Lenovo utilities before embarking on an upgrade, this time I figured I'd just give it a whirl as-is, and with just one application complaining that I had to uninstall. Hardly a big deal. Overall, it was my smoothest laptop upgrade, ever. That's saying something, since I've been installing various OSs on dozens of Thinkpads since 1995. I am having occasional Windows Explorer automatic restarts that are a nuisance, these could be due to older shell extensions or something not yet identified, still looking into that. Hamachi VPN 2.1.0.374 didn't like the upgrade too much. I simply had to reconnect it to the private network, not a big deal at all. I'll write up a separate article about that on TinkerTry.com soon. Yes, you can do a UEFI BIOS in a Workstation 10/Player 6 VM (seen pictured at right), installing Windows 8.1 on a 8TB virtual bootable C: drive, works great. I'll write up a separate article about that on TinkerTry.com soon. 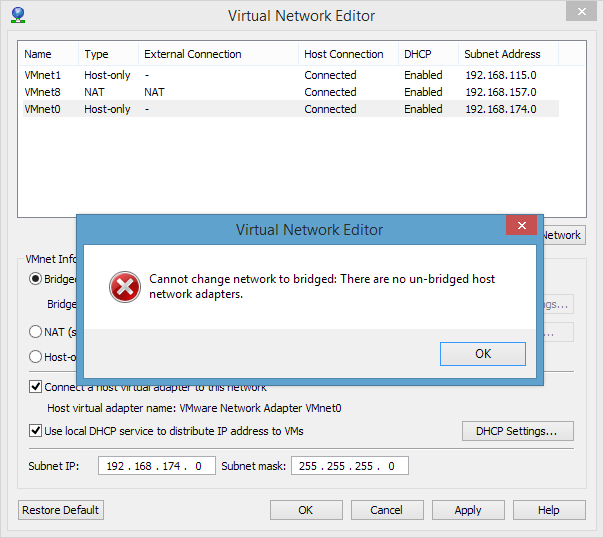 VMware Workstation 10's virtual networking component didn't like the upgrade though, but that fix was also simple, no reboot required. I'll write up a separate article about that fix on TinkerTry.com soon. 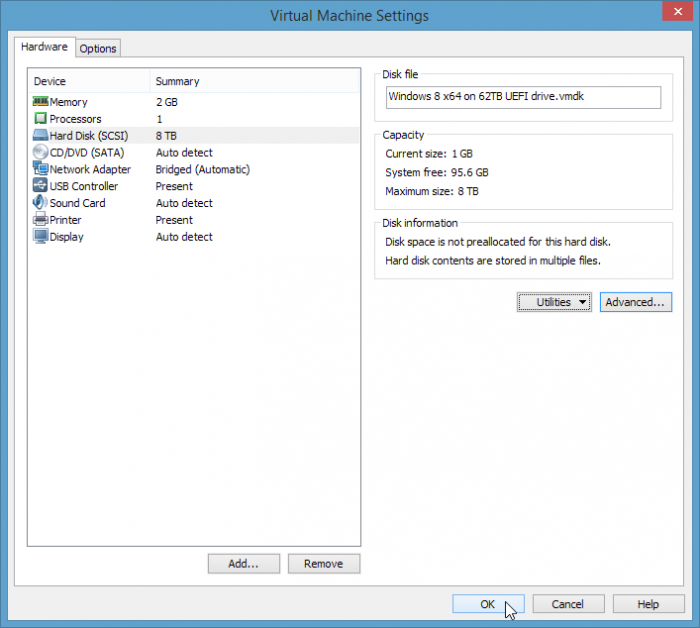 Yes, you can run Windows 8.1 just fine as a virtual machine under VMware Workstation 10 and the free VMware Player 6 Plus, described by me here, with a smooth install of the Windows 8.1 VM demonstrated on video here. Triple monitors for Windows 8.1 virtual machine works great too, very easy to configure. The good old super-simple Display Windows 8 Edition & Build Version on Your Desktop registry tweak still works just fine, on this Windows 8.1 Pro Build 9600. 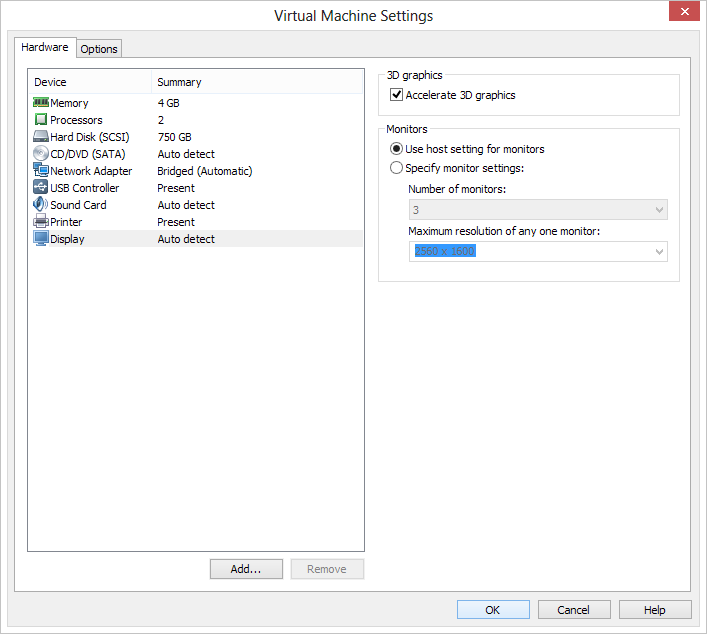 Using netplwiz.exe to avoid the login password (good for labs/VMss), combined with the automatic right-click-Taskbar, chose 'Show my desktop background on Start' option, and you've got yourself a VM that reboots in about 20 seconds. This was using my W520 with the VM on the SATA3 SSD. 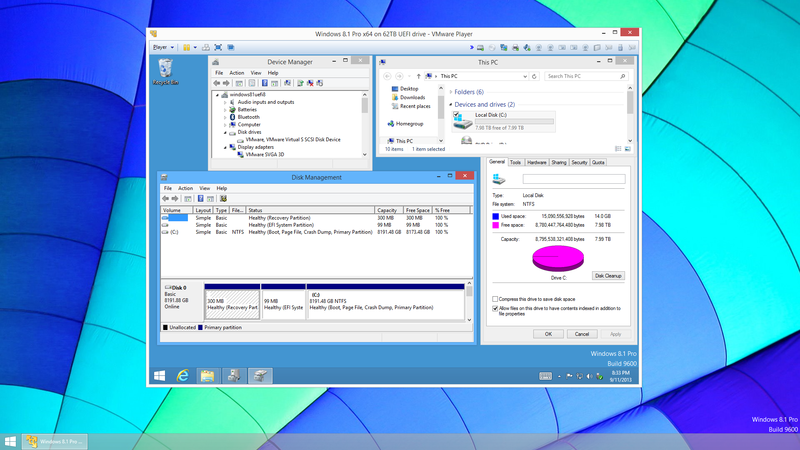 Daily backup of my upgraded system went over to my Windows Server 2012 Essentials overnight as usual, without incident. Network shared, backup status monitoring, all good. Since I'm already backed up and won't be using the Windows 8.1 rollback to 8.0 feature, cleaning the Windows.old directory is still a big disk space saver. The cleanup method I used is detailed in an addendum to my original article here. Finally, I can boot docked with 3 monitors, or undocked, with just the internal display, without having to fiddle with BIOS settings. The key was to leave discrete video mode on in the BIOS, and VT-d off. That was a hard one to figure out on Windows 8, and it's still necessary on Windows 8.1. Otherwise, the system hangs completely about a minute after booting, when undocked. I don't actually need VT-d on my ThinkPad anyway, so no biggie. Haven't gone back to trying Optimus again for some improved power savings, so for now, I'll still be able to see my BIOS screens at boot time on my external monitor, pictured on my desk. I forgot to first remove my older install of Stardock's ModernMix UI, prior to the upgrade. I did have the "Microsoft Store' running windowed give me a problem once or twice, so I removed Modern UI. No problems since, but too early to concluded much of anything on that minor issue, that was really my own doing anyway. Stardock's site doesn't specifically state 8.1 compatibility, yet. "My Computer" seems to have been automatically renamed "This PC". I'm OK with that. Apple Photostream seemed to have broken. No wait, opening the Windows iCloud Control Panel 2.1.2, and it was asking for my password. Still no joy. So I turned off the 'Photo Stream' checkbox, clicked 'Apply', then turned it back on again, and clicked 'Apply' again. Still monitoring that for progress, and I reported the bug at Apple's Support Communities here. Microsoft Flight Simulator (X) still works, even on my Nixeus 2560x1440 monitor! Early versions of Microsoft Flight Simulator were used to test for PC compatibility. If a computer could run MSFS 1.0 and Lotus 1-2-3, it was 100% IBM PC-compatible, and if it couldn't, it wasn't. Lotus Notes 8.5.3 is flat out stated as incompatible, but seems to(mostly) run with occasional crashes, even in compatibility mode. Time for a FP, or Notes 9? This was just a quick test, on an unimportant build of Windows 8.1. 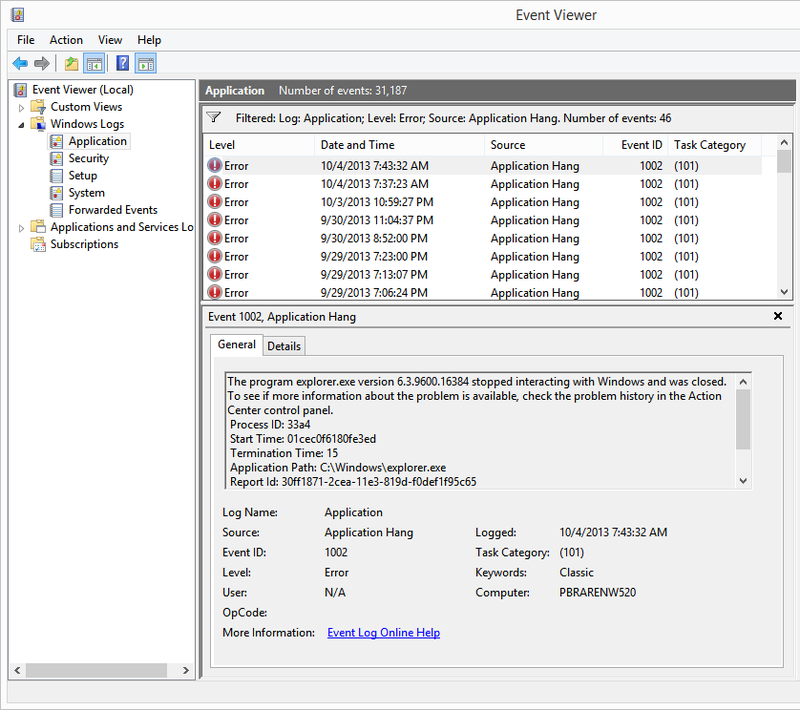 When testing netplwiz.exe (to temporarily avoid password login requirements), instead of logging in to the user account I was expecting, it went and logged in to the Administrator account. That was a surprise (new user, blank desktop). A normal reboot cleared that right up, the next reboot autologged into the user account. Video memory issues occasionally strike when about 40-60 tabs are open, across IE/Chrome/Firefix/Opera, not a big deal, close the affected app and start it again, clears it up. Again, this is likely due to my unusual multi-monitor configuration. 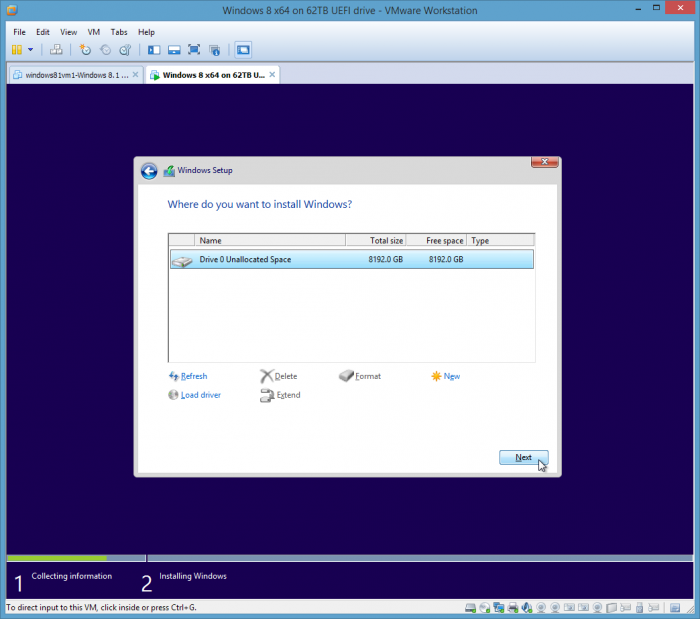 Making the (manual) jump from Windows 7 32 bit to Windows 8.1 64 bit. Got a Lenovo ThinkPad T60 going with Windows 8 today, incredibly straight forward, took all of about 15 minutes off a Rufus-built USB key. One self-inflicted misstep was me managing to associate the Office 2013 license key with a Windows Live account that had it's keys used up, so resetting the key with this tip, followed by entering the license key manually, worked right past that. No onscreen indicator for volume working, but the brightness onscreen slider does work. This Lenovo video about the issue, intended for prior releases, didn't help. I'll look into that minor issue later. Going with native 1400x1050 resolution worked out well, once I boosted the font scaling with the one-notch slider and rebooted. Nice! I made a virtual machine out of the Windows 7 32 bit that was on that system originally, before I even got started, just in case I forgot something during the manual migration of the data. 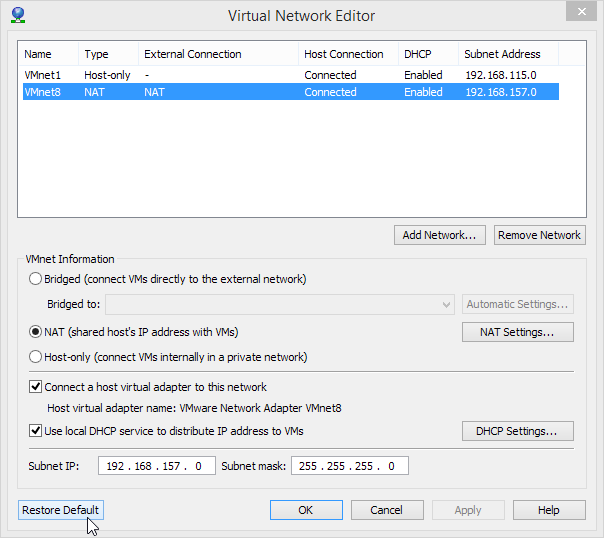 Full video of the use of VMware Converter 5.1 to ESXi 5.5 available soon, since there were some hiccups you'll need to work around. But all in all, a good experience, even on a lowly, older laptop. Installed on a Lenovo ThinkPad T61p as well, also uneventful, rather straight forward. Works well. Fn key doesn't wake up system by default, but power button does. 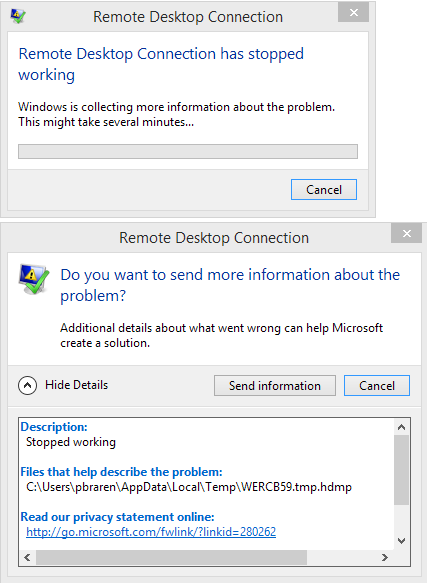 Finally, I noticed that Windows 8.1 on my W520 laptop likes to crash whenever the system is connected to disconnects for any reason, such as reboot, or lid closing (sleep) mode. -Save and close the file then start your Notes Client. My Lotus notes client is fast like a rocket now. is as high as you can safely go (I'm on a beastly 16GB of RAM W520). Put in higher numbers, especially above 1500, and Notes takes forever to start, and strange things may happen, such as a "Failed to login CLFRJ0010E: Notes initialization failed" message. 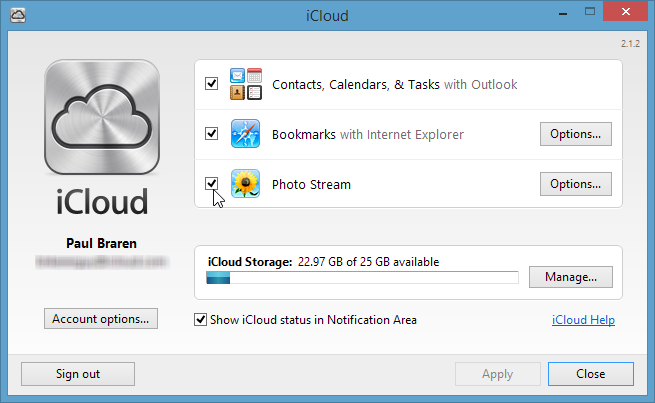 Apple Software Update offering iCloud Control Panel 3.0, with a lot of new features. It doesn't specifically call out Windows 8.1 in the System requirements page, but given it's newer than what I got, likely to help the issue I discuss above with Photostream. Explorer.exe crashing a few times per day, randomly. Annoying, but desktop and Windows 8.1 UI quickly, automatically recovers. Something I'm just keeping an eye on. Looks like LogMeIn needed to be reinstalled as well. So check both Hamachi and LogMeIn remote control after an upgrade to Windows 8.1, to be sure they both work, before that laptop leaves your home!